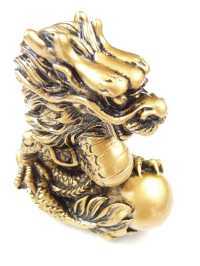 This is a four claws feng shui Dragon, and is one of the Chinese animal signs. It symbolises positive energy, and is good for everyone, except Dog year people. In particular, people who born in the Rooster, Monkey, or Rat year should have a symbol of a dragon. It represents harmony and brings mentors to these people. The good position for a dragon is the East of your home or office. You can put it on top of furniture or a book shelf.